Facing up to Global Warming: Maybe creating an army of mini Eco Warriors can help? Maybe creating an army of mini Eco Warriors can help? The picture says it all, we talk so much about leaving a better planet to our kids, that we forget about leaving better kids to this planet. With our climate recently becoming more and more unstable, there seems to be a lot of concern and general talk about the environment. Phrases like ‘global warming’ and ‘sustainable resources’ are appearing more frequently in the media, so much so that we no longer take much notice of these articles. Should we really be paying more attention to these issues though? Becoming desensitised to these common phrases isn’t going to make the problem go away now and it never will. It is our responsibility, whether we wish to acknowledge that fact or not, that this is our planet and what happens to it and its vital resources is down to us. But what can we actually do? Reduce, reuse, recycle? Yet another common phrase often recited in response to questions about protecting the environment, which has lost its meaning for a lot of us. What about education as an answer? Education never seems to be brought up in relation to protecting our planet. 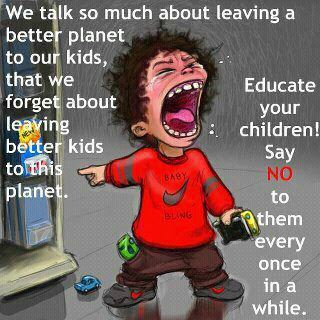 We only end up learning about environmental issues when we already have bad habits in our daily lives. Driving to the shop that’s less than a mile walk away, throwing out plastic bags instead of reusing them or bringing your own bag shopping, leaving the tap running when brushing your teeth or washing up after dinner and buying way too much food in the weekly shopping, thinking that you’ll eat it all. Sound familiar? We all do it. We get to this age, living on this planet, using its resources without care like they’re never going to run out, purely because we have never had cause to worry before and because we didn’t know the bad effects our behaviour can have on the environment. It’s not down to ignorance that a lot of us young people have such environmentally unfriendly habits; it’s down to a lack of proper education around the topic. Maybe if we had been better educated about the environment and its decreasing resources from when we were little, we would have different habits and different views now, at this age. It wouldn’t be a case of having to try and change how we live; more that we grew up being contentious, saving resources and trying to protect and appreciate the environment around us. I don’t mean to try and turn kids into mini eco warriors; I mean to better educate them earlier about what’s actually going on in the environment. What are the resources we need to be worrying about? Which resources are running out and what are the more sustainable options? Maybe try and make things like recycling and water conservation normal everyday things rather than a bonus, which is how they’re seen now. Maybe if parents stopped worrying about infections and cuts and bruises and threw their kids outside during the summer to enjoy nature and have fun outdoors rather than letting them stay stuck inside playing with plastic toys and expensive electronics which are causing even more damage to the environment. Maybe if nature actually meant more to us from when we were little, we would be more bothered about getting out and doing something about environmental issues rather than sitting inside reading about and talking about global warming and sustainable resources on our smartphones and laptops.